It is now mosquito season. That means that you should be preparing your yard to help keep mosquitoes away. If you are looking for an easy to way to do this that is effective and budget friendly, then Spartan Mosquito Eradicators will be the answer to your problems. Spartan Mosquito Eradicators control your mosquito population without the use of chemical sprays, fogs, or candles. For less than $9 a month you can protect your family and loved ones with the one and only Spartan Mosquito Eradicator. The Spartan Mosquito Eradicator is a uniquely effective, long-lasting (up to 90 days per deployment), continuous mosquito control system that is simple for anyone to use – add warm water, shake, and hang. Spartan Mosquito is an all-natural alternative only: Sugar, Salt, and Yeast. Once mosquitoes feed on the water solution, they are eliminated before they can breed again. That means your oasis will be free from the nuisance of mosquitoes! The Spartan Mosquito Eradicator retails for $19.95 per box. You will need one box per acre at the start of mosquito season or two boxes per acre if first deployed during the season. • There are two mosquito eradicators per box – protects up to one acre. • An informative instruction booklet. Yes, it does! 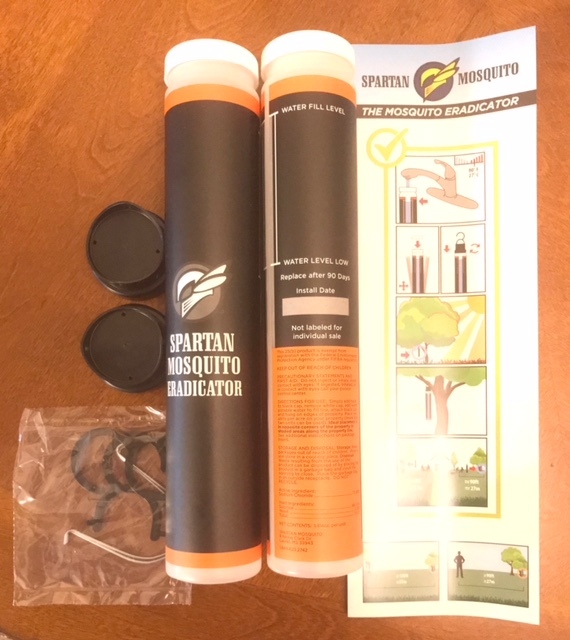 The Spartan Mosquito Eradicator is product that worked wonders for both our front and back yard. We placed them in the front and back yard in the evening we received the product. Within 24 hours, we did not have any mosquito bites and did not see any the whole time we were outside. In the instructions, it states that with proper placement, the mosquito population in the area will diminish by 95% in 15 days or less. So they are very effective in keeping mosquitoes away. I am so happy and thankful that we can go outside without putting on any bug sprays or bug lotions. No more itchy children nor parents. Take the time to protect your family from mosquito bites this season. Protect them with the Spartan Mosquito Eradicator.